Silver is Still Cranking out a lot of 2 to 6lb Rainbows! 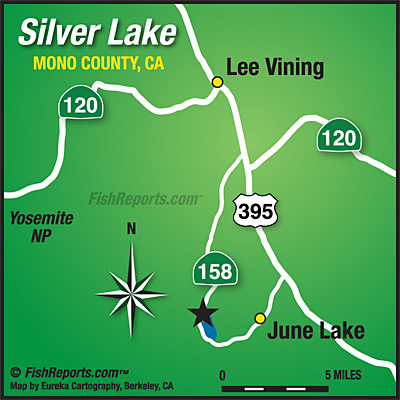 Silver Lake Resort (760-648-7525): Silver is still cranking out a lot of 2 to 6lb Rainbows with an occasional Brown. This is mainly due to the abundant stocking of those Oregon Rainbows with another load due in June. As I was standing in the store a guy came in with a 3.8 'Bow tube fishing with wooly buggers - good approach to try in any lake. Tom the dock man is adamant that leaders must be 5' long with floating baits due to up to 3' of weeds in the lake. He says pink and white mice tails are working best right now. He should know, he's right there on the lake. Please note that Silver Lake Resort RV Park has full hook ups and propane service.